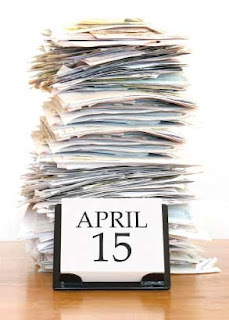 Today is tax day and I know you’re still working on your tax forms. Me? I did my taxes months ago and my tax return has been earning nearly 2¢ per month in interest. See? That’s what being on top of things earns you. Since I’m so together when it comes to taxes, I’ve decided to share with you my best tax tips. Frantically call your employer and ask them to re-send your W-2. Refuse to file your return. The IRS will never miss your tiny little chunk of change. Sit back and laugh at all the jokers that didn’t file earlier. Fill out your 1040EZ so that it can only be read in a mirror. If you owe write “For abortion funding only” in the Memo line of your check. If the Government owes you, ask them if they will wire your return to offshore accounts. Use staples. Lots of staples.